Charlie Appleby already has one hand on the Sydney Cup trophy if the betting markets are right but what can we expect from the lightly raced Dubhe when he steps out at Randwick on Saturday? The Godolphin stayer has been quietly going about his business at Canterbury since arriving on Golden Slipper day and his trackwork rider Paul Eddery says he can’t be faulted. 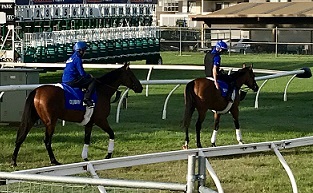 Dubhe (front) and D'Bai heading out for work at Canterbury on Monday. “He’s travelled over well and he’s done well since he’s been here so we’re very happy with him,’’ he said. “He’s pretty fit and there’s no problem about him getting the two miles. Punters have steadily warmed to Dubhe since TAB opened all-in markets on nominations in February and he was a $26 chance. Through the month of March the gelding firmed almost by the day, with only one ease being on Golden Slipper Day (ironically when he touched down) as a reaction to the win of Midterm, and with the final field and barriers announced on Tuesday is a dominant $3.50 elect. Appleby nominated Dubhe and considered stablemate Ispolini for the Group 1 $2m Schweppes Sydney Cup (3200m) but the latter stayed in Dubai and finished second behind Melbourne Cup winner Cross Counter in the Dubai Gold Cup. Dubhe, described on the Godolphin website as a 'very useful stayer' has only had seven starts and won three of them, ticking off the 3200m box at his latest start claiming the Al Naboodah Honeywell Partnership Handicap, a rating 104 race, at Meydan on February 7. Of course Appleby won the 2017 Sydney Cup with Polarisation and while that horse was a more experienced galloper the races he contested prior to his Cup weren’t dissimilar to the quality Dubhe has met of late. Eddery said there is upside to Dubhe though he doesn’t rank in the same class as Cross Counter and Ispolini. “He sits a good bit behind them but he’s definitely improving,’’ he said. Dubhe was allotted the same weight of 51.5kg that Polarisation carried two years ago but is likely to carry 52.5kg if weights are raised as expected. Godolphin has booked Kerrin McEvoy to take the ride – McEvoy got the job done on Cross Counter in the Melbourne Cup – and he’ll give the four-year-old a piece of work on Wednesday morning that will serve as his main gallop for the week. Given Appleby already has a feel for the type of horse required to win the Sydney Cup it’s no surprise he’s sent an up and comer who will beat the handicapper rather than a more established star. “I think Charlie saw that he stays well, he’s a strong stayer which is a must here, and looking at it at the moment the stayers don’t look that strong here,’’ Eddery said. D’Bai, the second Godolphin galloper in Sydney for the autumn, will be making his Sydney debut in the Group 1 $600,000 Schweppes All Aged Stakes (1400m) on April 20.